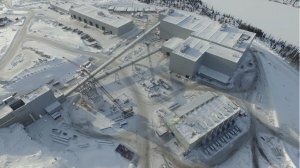 TORONTO (miningweekly.com) – Six months ahead of starting first production at Quebec’s only diamond mine, builder Stornoway Diamond Corp has increased the compliant probable reserves at it flagship Renard project by 4.4-million carats, while also announcing earlier access to more carats, albeit at lower grades in the mine plan. Starting September, the mine was expected to start processing ore according to a new mine plan, based on a significantly improved resource estimates completed last year, now totalling 22.3-million carats, as well as incorporating a rebaselined cost and schedule to complete the project. “The project continues to demonstrate a robust valuation and a cash operating margin of 59% after all taxes, royalties and the Renard diamond stream, despite the substantial recent reduction in rough diamond prices. We look forward to building on our track record to date of solid project execution as we bring Renard into production later this year,” stated president and CEO Matt Manson. TSX-listed Stornoway reported an unlevered, stream affected, after-tax net present value at a 7% discount of C$974-million as at January 1, calculated with commercial production expected to follow end-December. This was a 150% improvement over any previous mine plans. "I think the most significant takeaway was the decrease in average price per carat of reserves from $190 to $155, or about 23%, over the last two years, which compares to a global average decrease of about 17% over the same period according to my index figures," said independent industry analyst and consultant Paul Zimnisky in an interview with Mining Weekly Online. He noted that the the revised increase in reserves and throughput, and the decrease in overall grade, was expected and was already factored into the stock price, resulting in relatively apathetic trading in the stock following the announcement. Commercial production was expected by December 31, 2016, a five-month improvement on the initial project’s execution schedule. In the first decade of operation under the new plan, Renard output would average 1.8-million carats a year, with schedules of 1.9-million carats produced and 1.4-million carats sold to the end of 2017, which showed increases of 24% and 57%, respectively, compared with the previous plan. Stornoway managed to clip the project’s initial capital cost by C$250-million to C$775-million within a 14-year life of mine (LoM). In 2018, the operation was expected to kick production up a notch, lifting the processing rate by 1 000 t/d to 7 000 t/d, or 2.5-million tonnes a year. Renard would have LoM operating costs of C$56.20/t, or C$84.37/ct, providing net revenue of C$4.56-billion that would yield a real-terms cash operating margin of C$2.7-billion or 59%, or C$120/ct after allowing for royalties, taxes and the Renard diamond streaming agreement. The company reported a 25% increase in the probable reserves from 17.9-million to 22.3-million carats, contained in 33.4-million tonnes grading 67 carats per hundred tonnes (cpht). Renard openpit reserves had increased 339% to 8.91-million tonnes and 107% to 3.96-million carats in terms of contained carats. The new mining plan provided for a 53% reduction in average grade to 44 cpht. This was mainly owing to the addition of 4.58-million tonnes of Renard 65 ore at 30 cpht and over 2-million tonnes of Renard 2 CRB and CRB-2a ore at 20 cpht and 31 cpht. Stornoway further advised that higher-grade Renard 2 and Renard 3 ore has also increased in tonnage terms by 14% to 1.49-million tonnes and 10% to 790 000 t, at 92.7 cpht and 92.3 cpht respectively, reflecting the deepening of the Renard 2/Renard 3 openpit. Manson explained that a reduction in the average grade of the new mineral reserves reflected the addition of new lower-grade material within the openpit and underground mining envelopes rather than any material reduction in the grades of the ore units comprising the previous reserve statement. The new plan also updated the diamond price assumptions, exchange rates and consumables pricing. A 19% decrease in world average rough diamond prices tracked by independent consultancy roughprices.com between March 2014 and March 2016 informed Stornoway’s decision to lower the average diamond price estimate for the March probable reserves to $155/ct, compared with $190/ct in March 2014 terms. By comparison, the average diamond price of the January 2013 probable reserve statement was $180/ct in May 2011 terms. However, diamond prices were assumed to rise by 2.5% a year in real terms from March 2016, until the end of 2028. The new plan assumed a C$/US$ exchange rate of $1.35 to US-dollar denominated diamond sales and consumable purchases. Zimnisky pointed out that in the first two months of the year, De Beers and Alrosa combined sold about $2-billion worth of diamonds, of which about $1-billion replenished 2015 holiday and 2016 Chinese New Year inventory depletion. "It's not clear at this point when the additional $1-billion of new supply in the market will be absorbed, but the appetite of the De Beers' sight next week should provide some colour of demand expectations in the coming months," he advised. The Renard project included inferred resources of 13.4-million carats contained in 24.5-million tonnes grading 54 cpht, and 33-million to 71.1-million carats of non-resource exploration upside comprising 76.2-million to 113.2-million tonnes at grades ranging from 25 cpht to 168 cpht. The company advised that all kimberlites remained open at depth. Stornoway’s TSX-listed stock had gained 40% since the start of the year, and on Thursday traded up 1.94% at C$1.05 apiece.